Make it ok to "move the mission forward"
I'm no longer "surprised" by the surprise of a good idea. Since my brother and I have had a wallet (from about 10 years old or so! ), we both have carried an "extra" piece of paper - wherever we go. Over the past 28 years, here is something I've learned: A useful idea just may show up anywhere. Capturing the idea now, and nurturing that idea later just may be the most balanced work/life expression we can experience. So, you can believe my delight at dinner the other evening when our meal-time chat turned toward inspiration and motivation in the learning processes of corporate cultures (wow, that's a mouthful!). Two of our clients, at the dinner table, started writing ideas down for an upcoming presentation we are planning in September. Over the course of two hours we discussed timing, content, presentation styles, handouts and follow-up materials. My preference is NOT to leave any of those details to memory; I write them down, I can act on them. People ask me if it's ever appropriate - according to self-management/time-management theory - to ever just "do nothing." In principle, I don't believe anyone actually wants to do NOthing; yet in theory I understand what they are getting at. I think the ultimate in work/life balance will be achieved when you're ready for surprise, so it doesn't surprise you. Go out, sometime today, with the intention to do "nothing." Then, make it ok when - in the space between the notes - you start attracting ideas that just might make the world a better place! Are you sitting with the "right" people? Put the right people in the room [or, at the table] and amazing things happen. Last night after work here in London, 5 of us went out to dinner and quickly the conversation went FROM "tell us about California," TO "let's brainstorm ways we can produce educational programming for the bank in a way that engages more learners?" Jodi and I took the opportunity to share many of the programs we've been involved with creating over the past three years. In fact, just last weekend we were co-presenters during some sessions at PresentationCampLA - a GREAT example of what happens when you "put the right people in the room." 1) More groups are willing to experiment with "what could be." This is exciting, as we can capitalize on both traditional and "new" learning models to engage more associates in the learning and implementation process. For example, I can take my practice with "Bloom's Taxonomy" of lesson plan building, and add in my own understanding and use of Twitter as a learning tool. 2) It's ok to have a "not perfect" idea. One of the special things about having dinner with people I have a history with, is they know that my idea-generation ability is pretty expansive...Give me a couple of hours, with the right people at the table, and we'll create many more ideas than we could ever implement! 3) And, finally (an extension of #2 above), when I DO pick something to do...Watch out: It will get done! It's amazing when we take the opportunity to Stop...Reflect...Consider...Act...Assess. So, we'll be back in London in September (and Zurich) and in between now and then A LOT more travel (check out the schedule on the right side of our newsletter page...) as we're partnering with more learning organizations. The good news about being "learning consultants" is that each group we work with benefits from ALL we see going on out there (and...There is a LOT going on...). If you ever get the opportunity to attend one of these ( http://barcamp.org/ ), it's worth it. Today's charge, $10! I got to do SO much creativity...I even got to write on the office walls - they are all windows! 2) Work backwards during the rehearsal period. I've always practiced, but now I want to practice with the idea of "rehearsing" the beginning, the middle, the end, the Q&A period, even "coming back from a break!" 3) Step up...y'all! If you're thinking of upleveling you, find a way to surround yourself by other people upleveling themselves! Sure, you can watch a video, read a book, or write some notes in your own journal...But, there's nothing like surrounding yourself with other people as dedicated as you are to the journey. July, 2009 - there's a great "how-it-works" for Kiva.org. Who knows what you're involved in? Amazing things can happen...would you agree? Here is THE question that got me out of bed this morning: "If WHO knew WHERE I am focused, we could positively influence WHAT?" That is, if we were "here" and needed to get "there," who on our team needs to know we're looking for support, guidance, assistance, ideas and motivation? Just last night, I was telling my friends about my interest in and support of Kiva.org. We recently "started" the Ojai Kiva Club as an experiment in community. I've been lending to entrepreneurs for quite some time, both informally (friends and colleagues) AND formally (Kiva and other organizations). So, as I described the Ojai Kiva Club about what we're doing, I held their interest for more than a few minutes. Here's an example of one of the more than dozen loans I've been involved in. So far, only one loan is delinquent, none are in default, one has been repaid, and all the others are making their regularly scheduled payments on time or early. Almost weekly now, I can go into my Kiva.org account and withdraw OR reloan the funds I have there. As I ended my day, yesterday, I noticed the "flashing light" of a new e-mail on my phone...When I checked it, I read that one my friends at dinner had already decided to fund more than 10 loans himself! A perfect example: If WHO knew WHAT...they might get involved too! PS: Now that you know, might you be able to make just one loan? When you do, simply choose the Ojai Kiva Club as your group! You'll get your money back soon enough and get to decide: Re loan or Withdraw? What a cool life, huh??? Your mindset is the key to unlocking your creativity, intuition, and the kind of action-oriented thinking that gets real results and success. But how do you do it? How do you actually change your mindset – especially with so much negativity about where the world seems to be going these days? The first step is identification. Start by identifying one area of your life (career, family, education, finances, etc.) that you want to enhance or improve, and focus on that one area exclusively. For example, one client I worked with identified career as the area he wanted to improve. An employee of a large mortgage firm, my client had watched another colleague quickly advance in the company after weeks of night school classes turned into more money, more benefits, and more power. My client wanted that, too. He wanted to advance in the company. After clear identification of your goal, the next part of changing your mindset is to begin identifying with your own thoughts about that goal and being honest with yourself. Early in our coaching program, my client admitted that he had a "not enough time" mindset that had to change. Not enough time: that was what was holding him back, he said. It seemed there wasn't enough time to study, to take classes, to write papers – even though a close colleague had done it. "Each day I find an opportunity to learn or practice new skills." "Every morning I consider some part of my education from a new angle." He reviewed these reminders at least once daily; they were either written on 3X5 note cards or scheduled e-mails sent to his mobile phone or e-mail inbox. By reinforcing these new beliefs, he began spot opportunities that his former mindset may have blocked from view. The result: He found a school that catered to working professionals, offering night and internet classes, and he began to believe in his new beliefs. An interview is now available in a new book, "The Power of Slow"
I'm VERY excited about this book coming out. 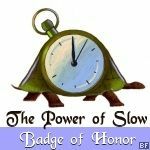 While writing The Power of Slow, Christine Louise Hohlbaum interviewed me a few months ago (or more?) and I'm "in" chapter 2 of her book! There will be continued conversation of time empowerment at http://PowerofSlow.org. I’d be thrilled to see you there! Do keep in touch and thanks again for your tremendous contribution. Here’s to your success…and the power of slow! When you think about it, what comes to mind? When you give yourself the gift of a little bit of your own attention...and then direct that attention out to your immediate and near-term future...what shows up? If dealing with the tech side of your service-based business -- from cell phones and computers to everything web -- creates confusion and slows you down from doing what you DO in your business, keep reading! For many of us, technology is the one area where we feel the most confused, time-drained and annoyed. It feels like a sea of never-ending new things to learn and complicated decisions to make, without an understanding of what effects they have. Weren’t computers supposed to make our lives easier so we can just create and serve our clients?